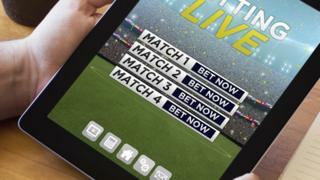 Two men have appeared in court charged with offences under the Gambling Act in what is believed to be the first prosecution involving betting on video games. Craig Douglas and Dylan Rigby, who are both from Essex, are charged with promoting a lottery and advertising unlawful gambling. Mr Douglas makes gaming videos on YouTube under the pseudonym Nepenthez. He is also charged with inviting children to gamble. The two men appeared at Birmingham Magistrates' Court. The case has been adjourned until 14 October.